Carbonated Drinks Recipes to Make Strawberry Sweety .Not quite fit it if serving treats on the coffee table just with cakes or snacks without drinking. But roughly drink what ya right moment and definitely preferred her? The answer is ice strawberry soda. Strawberry or strawberries in addition to sweet and fresh when chewed directly can also be varied into fresh fizzy drinks such as iced strawberry soda. This drink is very practical once when made ​​because it only uses ingredients simple and instant. Just set up your serving glasses and fill with ingredients and finished ice strawberry soda. 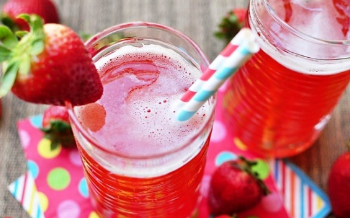 Here is a recipe to make fizzy drinks strawberry sweety can try to make at home. Prepare a medium large glass then fill with orange juice packaged instant and add a few pieces of strawberries and kirwi. Toss well. Add the ingredients in a glass with soda water and crushed ice cubes. Drinks fresh ice strawberry soda is complete and ready to be presented. Make a fresh drink iced strawberry soda is very practical and fast, perfect if made for serving treats for guests. The materials prepared above can be made up to 4 ice strawberry soda. 0 Komentar Untuk "Carbonated Drinks Recipes to Make Strawberry Sweety"